The elegant Downton Abbey Traditional low level toilet, ideal for creating a period look in your bathroom. Manufactured using high-grade vitreous china ensuring a quality finish and long lasting durability. Bring a touch of elegance and style into your bathroom. 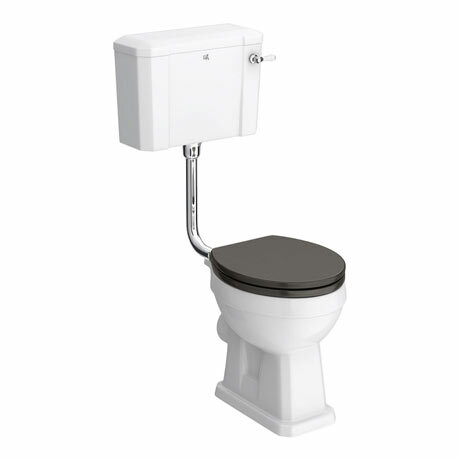 Comes with a soft closing wooden toilet seat and a 5 year guarantee against manufacturing defects. Supplied with low level chrome flush pipe kit and traditional ceramic lever. Wooden MDF toilet seat is available in a variety of colours + finishes.